A basket of wine, fruit, and gourmet food is always a welcome gesture. Choose your selection of wine to accompany the fruit and gourmet items. Each basket is a one-of-a-kind creation, specially prepared by an experienced local florist in your recipient's area. Fruits may include apples, pears, or bananas. Gourmet selections may include cheese, nuts, meat, or hard candies. Photo shown online is a representation only. Specific labels of wine, brand name foods, and any specific item shown may not be included according to local availability and designer's choice. Your Choice of Wine: Chardonnay, Merlot, a Bottle of Each, Two Merlot, or Two Chardonnay. 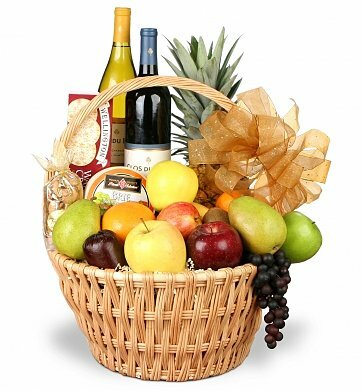 Grand Celebrations Fruit and Wine Basket is a hand delivered gift. These gifts are delivered by one of our local design centers located throughout the United States and Canada. Same day delivery is available for most gifts when ordered before the cutoff time. The cutoff time for Grand Celebrations Fruit and Wine Basket is 1 PM in the recipient's time zone. Delivery was on time, on the day promised, and the recipient was delighted with the gift basket. I didn't get to see it but my mother absolutely gushed about the variety of fruit and the wine. A lot of the baskets have chocolate. This is a good basket for someone who doesn't want or like sweets, although there are some in the basket.